Interacting with potential employers online can be a daunting task. 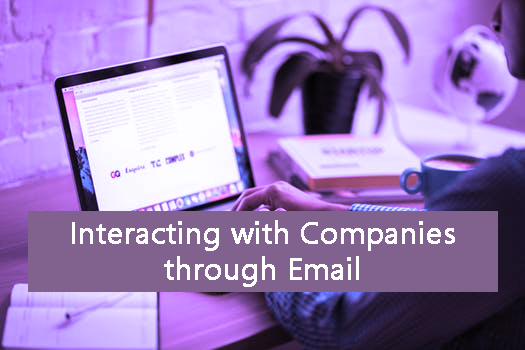 Often job seekers have no idea how to stand out in an email and end up spending hours reshaping and crafting emails to align with what they feel to be the culture of the organization. When sending an initial email out, make sure to keep it formal and concise. The longer and more confusing your sentences are the less of a chance there is that you’ll get a response. Once you get a response, stick to the same tone as the responder. For example, focus on diction used regarding the first or last name of the hiring manager in the email. If HR refers to the hiring manager by their full name or last name then do the same. Employers are very impressed with emails that are communicative and to-the-point. Reread emails and check for spelling and grammar errors. Bad punctuation demonstrates a sense of carelessness. Hiring managers will use every bit of information to decide whether your email is deserving of a response or not. Just remember that practice makes perfect, so incorporate these helpful habits in order to greatly increase your chances of becoming a top-level candidate.